Arsenal midfielder Mesut Ozil is reportedly the subject of interest from Turkish giants Fenerbahce, who are hoping to capture the German when the transfer window re-opens. Since signing for the Gunners in 2013 from Real Madrid, Ozil has appeared over 190 times for the club, contributing 37 goals in the process. The 29-year-old playmaker has long been revered as one of the most gifted players of his generation, but his time at the Emirates has often been blighted by inconsistency and a perceived lack of effort at times. The former Madrid star became a World Cup winner back in 2014, but fast forward four years and it was a very different story in Russia with Joachim Low’s squad. Germany exited at the group stage after losing games against Mexico and South Korea, with Ozil in particular, singled out for criticism in the national press. The German midfielder retired from international duty in the wake of the tournament and despite featuring in three of Arsenal’s four games at the start of the new Premier League season, it has been suggested that he is struggling to cope in the spotlight in recent times. 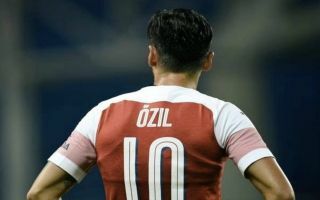 According to Aspor, Turkish Super league outfit Fenerbahce are preparing to make an approach for Ozil in January, who despite signing a new contract at the end of last season, appears to be unsettled as part of Unai Emery’s new set up at the Emirates. The Daily Mail reports that Emery and Ozil were embroiled in an alleged training ground bust-up when the Spanish boss informed his charge that he would not play a part against West Ham United in August, but the Arsenal manager quickly put pay to the rumours by revealing he was unavailable due to illness. The Mail also states that any bid from Fenerbahce would have to be in the region of £42 million for the club to even entertain the possibility of offloading Ozil, which could put off the potential suitors. Arsenal resume their domestic campaign this weekend against Newcastle at St James’ Park and supporters will surely hope that their number 10 can shrug off any transfer rumours to re-discover his best form and guide the team towards a third successive league victory.